Boeing does a lot of things very well, and returning value to shareholders has been one of them. Before yesterday, investors had hoped that The Boeing Co. (NYSE:BA) would raise its dividend -- and substantially. Analysts had even expected a hike as high as 50%, and while it failed to reach that lofty estimate, it was still a substantial move higher. Here are the details, what management had to say, and what's next for investors. Boeing's board of directors announced late Monday that the company's quarterly dividend will increase 30% to $1.42 per share, bringing its yield to roughly 3.6%. The commercial aircraft juggernaut has now paid a dividend to shareholders for more than 75 years and raised its quarterly payment by roughly 190% over the past four years alone. Officially, the new dividend will be payable March 3, 2017, to shareholders on record as of Feb. 10, 2017. That wasn't the end of the good news, either: Boeing announced another way it would return more value to shareholders. It will replace the existing share repurchase program with a new $14 billion authorization. This wasn't much of a surprise, as the company had completed its repurchases for 2016 and bought back $7 billion worth of shares from the prior $14 billion authorization that began last December. So this was basically just hitting the reset button and bringing authorization back to $14 billion. For the past 15 years or so, Boeing has done a phenomenal job of returning value to shareholders by decreasing outstanding shares while simultaneously -- and rapidly, starting a decade ago -- raising its dividend. Look at the "X" that forms over time in the graph below. 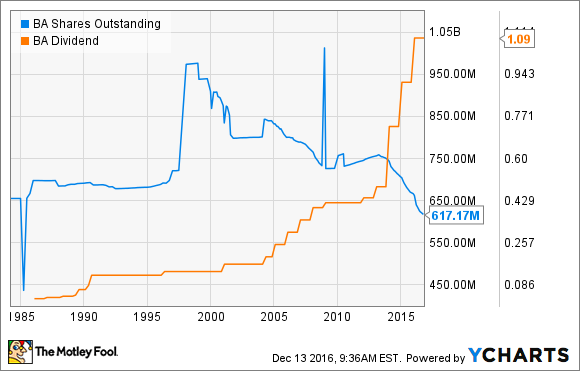 BA shares outstanding data by YCharts. As our team delivers on our large and diverse order backlog, and drives greater efficiency across our business, Boeing is well positioned to generate increasing cash flows and meet our commitment to provide competitive returns to our shareholders. At the same time, Boeing is continuing to invest in our people, innovation and growth as part of a balanced cash deployment strategy. The plans we announced today demonstrate our ongoing commitment to return cash to shareholders through a growing dividend and share repurchases, and reflect our confidence in our financial strength and the long-term outlook of our business. Boeing investors since before 2013 have enjoyed quite the ride, with shares doubling in price over that time. At the end of the third quarter, Boeing's companywide backlog had 5,612 planes valued at more than $460 billion, which provides years of transparent top-line growth. Management also expects Boeing's defense business to stabilize and begin to improve, which is a breath of fresh air for investors who have watched the segment shrink over the past few years. What will determine how strong of a stock Boeing becomes in the near term will be how effectively it increases its production rates to cash in on its enormous backlog. Boeing's bread-and-butter 737 will move to a production rate of 52 per month in 2018, up from 41 per month today. If that production rate increase (among other product lines with rising rates) goes smoothly, Boeing will continue to fly high -- and pay you a rapidly increasing dividend in the meantime.